This gets personal. In fact, should I even be saying all this to people I have never met? What do I say? How far do I go? These are things I never talk about with strangers. Anzac Day is one of those mysterious days. We know the meaning, only what is the meaning precisely? I relate more readily to certain family birthdays and to Easter; more readily to All Souls' Day with its call to remember the departed, surely one of the things that makes us more human, than to Anzac Day. The day is a memorial for the dead, especially now that none of the original men at Gallipoli are alive to tell the story, but what else is it? My paternal grandfather, Edgar Harvey, was not only an Anzac but among those who landed nearly 100 years ago at the Turkish cove, later named Anzac, on 25 April 1915. Yet the family almost never talked about this, or subsequent events in his wartime experience. It was passed over in silence. It still is, largely. In a country where Gallipoli is treated as a moment of great national importance, it might be expected that I would feel proud to have a grandfather who fought there and survived. While that is the case, it was never instilled in me to feel that way. My father rarely if ever talked about his father Edgar's wartime experience. Silences in childhood may come to say that there must be secrets, or there are feelings too hard to express. Just being alive, I came to learn, is what is important, not being proud about knowing someone who was there. One thing my father, an Anglican, did repeat while I was growing up in the 1960s was Daniel Mannix's claim that the Great War was nothing but a trade war. The vehemence with which he repeated this assertion told me it stung, he was hurt by the truth of it. Such vehemence, I could see that probably Edgar himself agreed with the archbishop's proposition. It was for someone else's interests that young men had died in the trenches. It was an experience they had to go through, that they treated as an adventure, or took as it came. But did they know what they were doing? They were told it was for God, King and Country, but did they understand the politics? After Gallipoli, Edgar was moved to the Western Front. Wounded at the horrific theatre of Passchendaele, he remained unattended in No Man's Land for one and a half days. He was shipped quickly over the Channel to Wandsworth Hospital, where subsequently his right leg was amputated. That much I always knew. It was there he met a Hospital Visitor, Elsie Crabtree, my grandmother. This was a familiar pattern for the young men sent into that strange European nightmare. It was the familiar story for me. That most of the survivors came home halfway sane is itself a wonder. By talking to your family you learn more. For my mother, Edgar was part of the forgotten generation. The Returned Soldiers' League was the driving force behind pensions and repatriation, working at a level that the average politician would not have thought about. Edgar was president of the Blackburn RSL, went in the local marches, and did everything he could as a member of the Limbless Soldiers Association for fellow amputees and others in similar condition after the War. To their credit, consecutive governments to this day have supported these people. Edgar took it as it came, be it the war, or life afterwards. He was a vicar's warden, a chorister in church and chorales, and played golf regularly. But the loss of his leg meant for the rest of life there were episodes where for two days at a time he was on morphine, would stay in his bedroom, with total silence required. The phantom leg pains never went away. He always had a walking stick. Edgar was like many healthy young men who were permanently damaged for the rest of their lives, both privately and in their career. I will never know what he really thought of Anzac Day. My maternal grandfather, Charlie Hulme, also went to the Great War. The silver teaspoons from Beaulieu and Ypres gleam in the family cabinet. Charlie's experience was different from Edgar's. He was a machine-gunner, and I was often told as a child that most machine-gunners survived the war for the very simple reason that they were protected by the gun shield. He used to say that he was only wounded once, when he cut himself in the mess with a tin-opener. This story is family folklore. One can only imagine the things he must have seen. Charlie hated war and never talked about what he really saw. He rarely mentioned the brother who was killed in 1917; the loss was important to his silence. The war was not a point of conversation at family occasions, even if he wanted to talk about it. He also detested the jingoistic patriotism that came later. He never attended an Anzac Parade. He avoided the march, probably because the men would all reminisce and drink. It was all about getting drunk and Two-Up later, as far as he could see. Charlie was abstemious, but not a wowser. Self-indulgence was not an option for that generation. Charlie was a leader of Blackburn Rover Scouts and laid wreathes at the Shrine of Remembrance on behalf of the Scout movement, out of honour and to demonstrate to the boys how to show true respect. For Charlie the whole experience of the war was about survival. Young men, thrown together, quickly came to depend on one another. Themselves a mixed-up lot, they worked together in the trenches simply in order to get through it. Sticking together made tolerable a situation that was hostile, vicious, and ludicrous. You could die at any moment. They would watch their brothers and friends being shot to pieces right before their eyes. It was in these baffling and desperate circumstances that the men worked together. Later the term 'mateship' would be used of this behaviour, which is why the term today has changed. Mateship was about dealing every day with meaningless terror. Once arrived on the Front it quickly became obvious to these teenagers that the officers didn't know what they were doing. An acre of mud could be won then lost again within days. Consequent disrespect for the officers informed Charlie's disapproval too of making the chaplains officers, because they became distant from the soldiers. It tended to make it difficult for the chaplains to minister effectively to the men. Charlie married Evelyn McKeown in 1921. She never talked about the war either, but when I visited her at Cabrini Hospital in the 1980s she was on powerful painkillers and not her usual composed self. Staring out over the rooftops of Malvern her mind was fraught by the past. I might have said something about her youth because she suddenly burst into uncontrollable crying and yelled out, 'Oh the waste! All those boys! The waste! The waste!' I was silenced by the sight of her distress. I still think about that day when I hear our glib modern throwaways like 'Haven't you got over it yet?' Trauma can never go away, it stays inside and changes how people relate to the world, how they understand everything, sometimes. Sixty years later my grandmother still mourned the young men she had loved and lost to the war. The war affected everyone's lives, got into every family. Two brief lives are presented here, the lives of two skilled artisans who were lucky and came back. One became dedicated to helping those in a similar wounded condition, the other to nurturing the next generation. Armistice Day (now Remembrance Day) was more significant than Anzac Day for my grandparents' generation, because it commemorated the end of a traumatic experience in their own lives. There was an ending. Those who came later ponder the distance between our way of remembering the War and theirs. Many of us live with uneasy thoughts about what our grandparents actually thought of Anzac Day, and the critical things they would say about how Anzac Day is celebrated now. It's a different world. Image: "Wild Eye", the Souvenir King (National Media Museum) - Flickr Commons. A splendid reflection, it is easy for those who never went to a war to make something of a celebration of events like Anzac Day. I was at Gallipoli a few years ago, I remember sitting in one of those small grave yards on the beach, I read every Cross, I sat and wept. So many lives lost before they were lived. Later at Lone Pine a group of Turkish Children sang their national anthem, I creid again. I have led many memorial services, celebrated the funerals of old diggers, we do forget the pain in so mnay lives and families. Anzac day above all others should be a day of quiet reflection, remembering lives lost,lives broken and the loyalty men and women have for their country and altruistic values. Peace, be still. "Consequent disrespect for the officers informed Charlie's disapproval too of making the chaplains officers." Yes, well the question is really what these soldiers of love were doing there in the first place, assisting with the trade war, mugging the mugs who went to war with stories of 'sacrifice' and duty to God King and Country. The Commandemnet, 'Thou shalt not kill' comes with fine print that nobody bothers to read, 'exemptions apply'. They certainly do to the hypocrites who serve as Jesus warriors in the interests of trade anyway. How many chaplains faced the firing squad for calling officers to account? None, but they sure as Hell stood there watching the shattered souls who did face the firing squad as they had Army justice served up to them, eh? ANZAC Day! Up your jumper, with its glorification of war for empty politicians to pose alongside. Time to end the day, as Trafalgar Day and Waterloo Day and St. George's Day have also withered and gone. No lessons have been learned. Just read about how our soldiers today are abandoned by their officers and politicians once they get back here, complete in body or missing parts but more likely than not, with 'mental' issues aplenty, from fighting another trade war that will never been 'won' either. It may seem a very minor point but I hate seeing "Anzac" as a word. It should always be written as ANZAC. New Zealand made an honourable contribution to the ANZAC tradition and should not be belittled by having the nation denoted in lower case. What school teaches students to use lower case for the name or initials of a soverign state? Thank You for this article. I knew WW1 was between 3 cousins. I have never delved into the reasons enough. "Old men create the wars, young men die" I often look at the faces of the boys going to war with sadness because I know if & when they come back they wont be young anymore. I had relatives who served in that war. One didn't return. I can understand the bitterness felt by some. Being used as cannon fodder for a cause that was not of their making. Thanks, Phillip, for recording these very poignant family stories. Beautiful for your own extended family to have, beautiful for the rest of us to share. Thank you. My father missed Gallipoli, to his eternal regret, but spent three years on the Western Front. All I know of the war I learnt from his C E W Bean history books, it was never spoken of in our family, except for the excitement (for me) of Anzac Day, my father proudly wearing his uniform and his shining medals. He died at 69, still with his shining medals, on his way to the Dawn Service...his heart could bear the emotion no longer. When our Diggers returned from WW1 they were given a letter stating they should not talk about the war to their families as it would be too shocking for them. So much horror, bottled up for ever except when with mates at the RSL! How many families were hurt for ever by that letter? That's a lovely haunted piece, Philip. The great Oregon poet William Stafford: "Violence is a failure of the imagination..."
Thank you Philip. My grandfather also was at Gallipoli as medical orderly. Like Philip's grandfather he also was injued on the Western front and the doctors wanted to amputate his leg but he refused permission. He had great pain from the injury for the rest of is life but I suppose he still had a leg. As if that was not enough he then went into a Pharmacy business at the beginning of the depression and went bankrupt because he could not refuse medicine to those who had no money. I recently discovered he suffered several breakdowns and spent time in the Goodna mental hospital. My own father never talked about his father - maybe it was shame about his father's breakdowns. My only childhood memories were of a quiet man who sat in the shadow of my larger than life grandmother. Thankfully I have an aunt who has been able to tell me what a wonderful man my grandfather was. My own father went to WW2 and said very little about that. He never missed a dawn service since the war and told me he went to remember all his friends who never came back. He never joined in the RSL celebrations. In the words of a popular song from several years back "War, war what the hell's it good for..."
Thank you Philip for this wonderful personal reflection. My father was named after an uncle who was killed in France. He in turn went off to do his duty in the Pacific as did most of my uncles. I grew up with the language of fighting the enemy, but also with the what I realise now was the "not said". I can see now how wars are politically manipulated and are part of the industrial economic system.Those who are on the front line are the tools used by them, then often discarded. The scales have fallen from my eyes as I see ANZAC DAY being created as a myth to perpetuate this military industrial system. 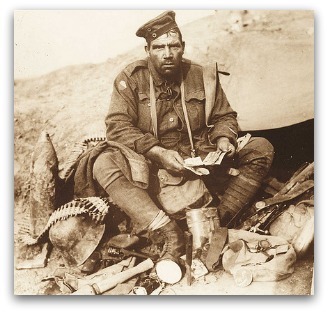 On this ANZAC Day, I remember my family members who died in wars, likewise those Aussies and Kiwis I didn't know. But I also remember those who died and are still dying on the "enemy" side. War does not bring true peace. When are we going to learn the lessons from the past? When are we going to learn the message of Jesus'death and resurrection? If we profess to believe in Jesus and the Gospel, we must learn to deal with conflict non-violently. For me the best thing that could happen to remember those who died in war would be the changing of the Department of Defence to a Department of Peace where we learn how to deal with our conflicts without using guns. I thank you too, Philip. I come from England and Remembrance Day was really important for us - two minutes silence at 11.OOam when we just pondered over the uselessness of such wars. It wasn't a time fo celebration. I found Anzac Day difficult when I fist came to Australia as it seemed such a celebration. Oh, the mystery! why do so many young Australians travel halfway round the world and come with such dignity and awe-filled reverence to the shrine at Gallipoli. They shed tears for the great sacrifice of human life, the great price paid by lambs led to slaughter. They sing solemn hymns of supplication and praise writ in Christian teaching. No rock music or bongo drums needed here to attract their presence. No cachophany of false community, no accomodation of disrespect, no crying room playgrounds, no jangling mobile phones, no promisory clinking of disturbing collection plates, no processional jingles in the offertory procession of wreathly offerings.Only reverence and respect for the sacrificial lambs. And yet our young abandon to oblivion with disrespect the shrines worldwide, built to give homage to a man who made the greatest sacrifice of all,so that all men for all generations could live. That is the Christian message. Maybe the incompetent educators and administrators in the Catholic church should take a leaf out of the RSL and LEGACY handbooks. Even more topical they might read the piece in today's Sydney Morning Herald (April, 26th)by Tanveer Ahmed entitled, "YOUNG SEARCHING FOR LIFE'S MEANING EMBRACE THE RITUALS OF OLD". Maybe it is time to cull out the bad(yet unforeseen and unplanned)fruits of Vatican II. Thank you for kind words about the memories written out here, and your own memories. I will respond to a couple of positions expressed in the blogs. To Andy Fitzharry: the whole question of religion in the First World War is very complex and asks for dispassionate understanding. Both Allied and Central forces fought under the same justifications of God, King and Country, and we have to remember that they did believe in these reasons, even if they didn’t believe in war. The role of chaplains was compromised, it has to be said, but they were individuals working in the same unique circumstances as all the other men, coming to terms with it and trying to assist. To Anne Lanyon: yes, Gallipoli was part of a new way of fighting war that served what Eisenhower over forty years later was to call the military-industrial complex. It wasn’t called that in 1915, but thereafter societies became increasingly aware of it. Eisenhower, himself a General remember, would have been shocked at the way the White House conducted the Iraq War, where outsourcing major job contracts to companies that were normally the army’s responsibility was all just part of business. To John Frawley: there are times when I think Anzac Day is the closest Australians come to what Americans call civil religion. I have mixed feelings about the Gallipoli backpacker phenomenon, but am open to the idea that it is a form of pilgrimage in which individuals make personal meaning by travelling to some special place reserved for memory, there to reflect and give thanks. Personally I don’t believe that the young have abandoned Christian shrines, but are as in need of the meanings in these places as any other generation. I tend to relate to Eliot when he says we arrive where we started and know the place for the first time. Philip, Thank you so much for your personalising war. At yesterdays Phnom Penh Dawn Ceremony the ritual was crafted like a Roman Church sacrament from outer space, words and the readings and hymns that left me untouched by the horror even I experienced in Vietnam as a chaplain and Captain. Your hidden memories stirred in me the similar stories I have witnessed by the parents and families of children who have suffered by the clergy sexual abuse and Catholic Church cover ups May the Parliamentary Enquiry bring some healing. To Michael Parer: thanks for this Michael, but I myself would avoid linking ‘hidden memories’ of wartime with ‘hidden memories’ of those who have suffered from sexual abuse of any kind. We are really talking about two very different kinds of trauma. My essay is talking not only about the memories of two men who died when I was quite young, but about how we reach after meaning in our own memories, which can be a haphazard and incomplete process. My essay is not talking about sexual abuse, or the suppressed memory that would accompany such traumatic experience. They are not the same thing and need to be discussed according to their own individual set of terms. On the subject of liturgy, my experience of worship is that it is a way of doing and explaining what you are doing the rest of the time. The words and actions of a liturgy are about how you deal with silence and thought and experience when you are not in a church. Services were vital for those men and women, and part of their means of understanding wartime trauma for the rest of the time. The rank of an officer still sits uncomfortably with Chaplains themselves generally. It is diminished in Navy by Chaplains not wearing rank yet they still hold the rank officer. Although Army Chaplains are Specialist Officers not General Officers we do not know ourselves as Captains but as Chaplains. our rank is actually Chaplain or Principal Chaplain. it is generally bthought that rank in Army allows Chaplains to enter the officer world tminister to them and advocate on behalf of soldiers. We must understand that what is really important is that after any war there is a life time of caring required for these men and women. war is expensive and none pay the cost more than warriers and their families and friends.